Those of you unfamiliar with All Star Cheerleading may not quite understand the upset of this write up, but I’ll put it in my own words to get you emotionally involved. Yesterday Mar 28, 2012 The USAF issued a change in rules effective for 2012-2013 cheer season. Who is the USAF? Basically the Government Body of All Star Cheerleading. And as I’m reading yeah it seems they are getting the negative press as our U.S. Government, but I digress. These rules basically banned elite tumbling skills such as double fulls, standing fulls, and whatever else that is amazing to see young athletes perform. Basically for safety…. To give you an equivalent example, let’s say we ban tackling from football, soccer no kick flips, or gymnast no tumbling on the balance beam—get the picture? On top of all that they have degraded the Cheer as sport pointing out that the crop top uniforms must be covered with a tshirt, how make up should be done, how big their bows should be. Maybe there is the stigma out there about cheerleaders as whole because of the negative media from “loose” NFL and NBA Cheerleaders, and how movies portray them in movies. But as a cheer mom, damn this kids are freakin Athletes! Oh and that isn’t the worst of it. After all this buzz about bullying in schools, and the press about suicides happening because of kids not “fitting” in. The USAF actually had the audacity to actually say “No overly theatrical movements from males” . Wow, really did we just backslide 20 years. Because what I’ve seen is that those on theatrics these boys have attitude and they are FIERCE! Now if this happened before the time of social media, you might not have heard about this unless you were in the culture. But, now I have to say there is definitely an uproar in the cheer community and it’s being addressed all over the USAF Facebook page and Twitter . And rightfully so, these athletes put blood sweat and tears perfecting their tumbling skills, you see the disappointment in their face when they don’t hit. And my daughter has come home in tears disappointed when she couldn’t perfect a skillset, but that’s what a competitive sport will do to you right it pushes her to be the best. So now that you understand what has happened and the reasoning for the upset. I really wrote this because I love how these athletes, parents, and gyms are really speaking up. What I really found that was really cool is that USASF at there highest got about 70 mentions on Twitter. On Mar 28 at the time during the conference call and release of the new rules it jumped 5500 to now today so far approaching 20,000! I am upset with the limitations and the degrading that they have done to our athletes, but I am anxious to see this carried on and where it will go. Remember how when you took a stand years ago you were really limited to how you could spread it? Well today voices are heard by millions instantly! I know I talk a lot about digital and what not, but the true expertise isn’t just understanding digital marketing concepts it’s the application of it all. By all I mean applying your marketing strategy both digitally and traditionally. Social Media- What does your presence look like? How are you using all the different platforms? TV– Hey we still love watching it so why not advertise on it right? Although I find it funny how so many companies sneak their marketing into my favorite shows. Next time you watch Modern Family see how many name brands you can find. I can’t blame the marketers with Tivo who needs to see pesky commercials anyway! Direct Mail– I have a love hate relationship with this one. Radio– Target market a specific demographic who are faithful to such radio stations, I get it. Newspaper– The only value I see there are coupons on Sunday, but I have to be honest I’ve never subscribed to a newspaper my entire adult life. So now that we can see how both a digital marketing and traditional strategy might look like. The true strategy is to have a 360 degree marketing strategy that marries them together. It really isn’t rocket science, but still to this day I see so many broken marketing messages. You know you see a cool ad on tv and then you go to the website to check it out and you can’t find what they were talking about online<— yeah things like that! 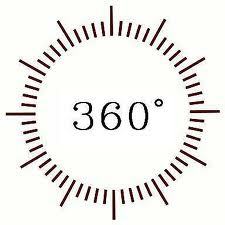 Now what does a 360 marketing approach look like? I’ll give you an idea of what it could consist of. Let’s say you’re a homebuilder and you just got the go ahead from Corporate to offer free basements for every contract signed within this 3 month promotion. Let’s create a landing page designed for conversion all about this great promotion and let’s be sure to have a special URL tied to it. If you can have this page within your own website I highly advise (that’s whole other discussion). Dig into your database of prospects and orchestrate a direct mail campaign, be sure to include the URL to your landing page and also throw on a cool QR code (bridge the gap). 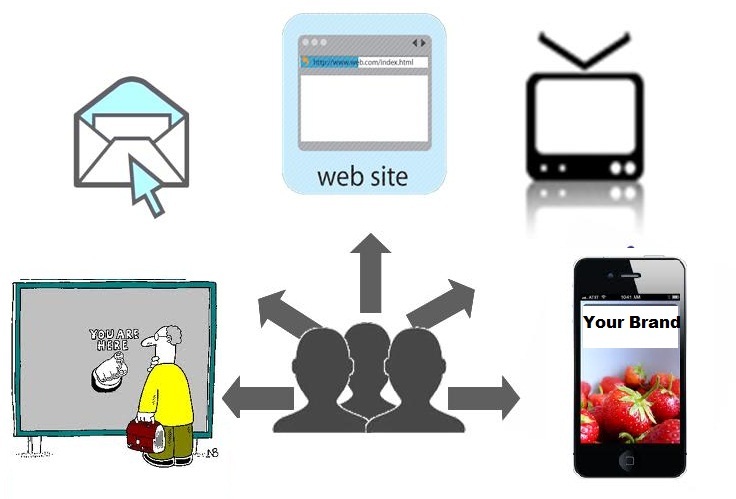 In the TV ad be sure to direct people to this landing page, because you want to CONVERT. Now be sure to create a strong pay per click campaign to direct to this page as well. So now for the “O” juice, not what you’re thinking ;-). The Organic Visibility! If you’ve done all the right optimization your page could start to show up on the first page of search, and of course incorporate this with videos about the promotion which will really boost your visibility. Your social media content should consist of things around this subject as well sharing videos, sharing blogs, and getting engagement. Remember to use some tools to track the “buzz” around this promo as well. Remember social media content ranks high in search so this contributes to the organic visibility as well. Also take advantage of Facebook Ads, you can create an awesome landing page app and direct people there which of course will tie back to your Landing page. Forgive me if I’m missing some other things I didn’t even get into mobile ads, or display, I honestly just thought of this seriously 5 minutes ago while writing- remember not rocket science. But the important element is knowing all the digital mediums. If you’re business does not have a champion in house that really understands and can apply these strategies for an effective “marketing marriage” then that’s where you’re missing the boat. Do you Feel like Superwoman Crashed and Burned? career paths on what they need to do, or what is most important. Like this picture I’m sure many women can relate to it. You’re feeling like superwoman and then all of a sudden you fall on your face! Be driven with your goals, and don’t settle even when you’ve reached a goal that you’re happy with. Men are driven to want to be better by nature, you don’t have to be a psychologist to understand that one. For women it’s easy to get comfortable or to stay content with something, And often times you might find your waiting for that promotion, right? Does that sound familiar? Big Mistake! Ask for what you want and be tenacious about it. This may seem obvious but unfortunately many women feel uncomfortable doing this. I did a small write up on this and it’s worth revisiting, Women Need to Brag More. Although obvious it’s one of the most important steps. It’s a dog eat dog world and if you don’t ask for what you want or pursue aggressively then don’t surprised if that person next to you takes that spot. If you don’t feel that you’re qualified then be sure to talk with your boss about your skills and explore the options of who you may be able to mentor with to gain those acquired skills. There are countless books that you can read until the end of the next decade, but in reality we’re wired to focus on the few not the many and by sticking to these main points will get you going on the right start. Okay so now that I’ve actually had time to look into the New Facebook Page in more detail and also reading in depth on the Facebook Pages Policy. So many people are ranting that the new Facebook Pages is death to businesses marketing capability. But in reality after playing with with it a bit more, sure we lost the ability the to have a default landing page, but I believe the gain for having a cover photo instead of those small photos that use to be there gives businesses more of the branding opportunity. It actually goes in line with the real strategy of social media . Sure you can have all this call to action and on and on, but seriously? Social Media has allowed us to amplify our brand and stay in front of consumers where they are ie.. facebook, twitter, pinterest, etc..
I’m excited to see the change because this will force us all to be more creative, and once again adjust to this shift. Another thing I’m happy to see all of the garbage pages disappear. You know the ones that aren’t real business, but just want you to like it and add no value whatsoever just to blast you with spammy links, Yeah those. For small businesses the page change will force you to get more involved with your business brand. Rather than just passing off social strategy to an outside agency or a kid in the basement, they could pretty much create the call to action pages and let them sit on cruise control. Now that all those distractions are gone with trying to keep up with facebook landing pages take a step back and really think about your Brand. For larger corporations I am looking forward to seeing many turn on the messaging feature which allows fans to send direct messages through fanpages. We are so accustomed with live chat I think this would be an easy transition for the general public. I just think of the many times I’ve been sitting on hold it would be nice to send a direct message to get an issue resolved. On the business side this would be easy to implement because with the Facebook pages comes different levels admins. So you can delegate the customer service to have access just for the messages. This will be a great addition! I love the ability to pin post and have them showcase at the top, well for seven days at least. Think of those times when you had a customer post a great review of your product or service only to see it get covered by other posts within 24 hours. Now at least you can control what you want showcased. So long story short no need to panic about the new change. Just keep an eye on big brands to get ideas if you’re a small business. Remember you don’t have to be guru just concentrate on what your brand and start thinking about how you’re setting up your community management levels. Check out their timeline history to get some ideas. Ford motor company – Not really digging the cover photo (at this time 3-7-12 it’s a building) let’s see when this changes… but the timeline is a nice blast in the past of the evolution of cars.